Violent Femme | Theater | Style Weekly - Richmond, VA local news, arts, and events. Virginia Opera moves the classic seduction of “Carmen” to 1950s Spain. 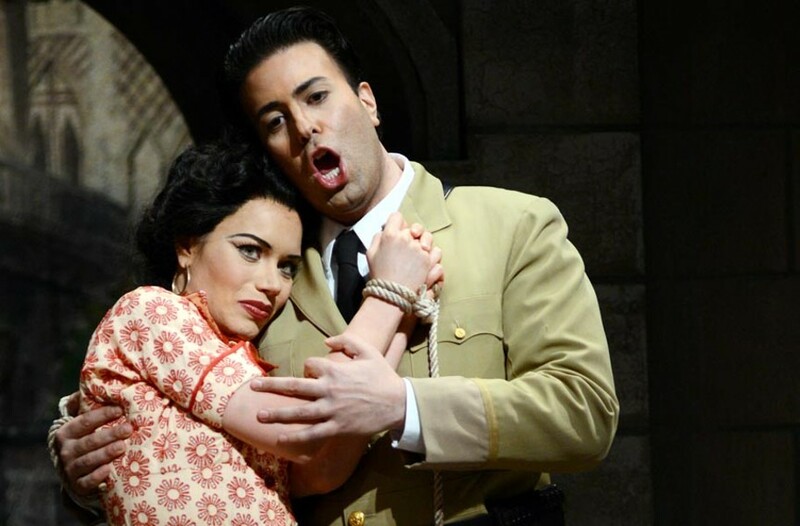 David A. Beloff Ginger Costa-Jackson, pictured with Dinyar Vania as Don José, has played the classic opera role of Carmen for three years and could nail the lines in her sleep. No matter how hard she tries, Ginger Costa-Jackson can't get away from "Carmen." It isn't that she's ungrateful — getting cast in the title role is a dream for most mezzo-sopranos. It's just that after playing Carmen three times in three years, Costa-Jackson feels like she could roll out of bed at any moment and start belting "Habanera." "It's kind of my typecast role, but I'm glad it is," says the star of the Virginia Opera production coming to town this weekend. "It's an amazing role. I'm going to stop fighting it." As Carmen, Costa-Jackson will take on the role of a rebellious Gypsy who woos and guilts men to get what she desires. Carmen seduces the soldier Don José into deserting his military duties and childhood sweetheart. She then falls in love with the dashing toreador Escamillo, setting off a series of tragic events. "Carmen" holds a special place in the opera canon, with Georges Bizet's music so recognizable that most people already are familiar with such numbers as "Habanera" and "Toreador Song." But the music isn't the sole reason that "Carmen" remains one of the world's most-produced operas. "'Carmen' is the original Broadway musical," conductor John DeMain says. Instead of recitative — where singers speak on the beat of the music — the opera has breaks between numbers in which the performers speak dialogue, similar to most American musicals. The opera also incorporates singing and dancing in a way that was innovative for the Opéra-Comique in Paris. When "Carmen" was first performed, the chorus nearly went on strike because they thought it was impossible to sing with the proper technique while dancing. "It's as close to perfect as you can get, musically, dramatically," says Dinyar Vania, who plays Don José in this production. "That's why it's never left the repertory since it first gained popularity." In the same way that "Julius Caesar" actually focuses on Brutus, it's José and his downfall that become the focus of this story. "Don José is your perfect storm of an opera role. It's very difficult to sing, and at the same time it's one of the best roles for a tenor ever written," Vania says. "The biggest challenges are being able to sustain yourself mentally and physically through the entire course of the opera." In this production, "Carmen" is still set in Seville, Spain, but it's transported from the early-19th century to the 1950s. Though Carmen will appear in a poodle skirt and the soldiers will carry semi-automatic pistols instead of muskets, the cast says the show will retain its dramatic impact. "The lines that you deliver are the same, it really doesn't change" Costa-Jackson says. "Even if I was wearing an aluminum bodysuit in the year 2500, it's still the same opera." With its exotic score and intriguing story, DeMain says this is the best opera for first-timers. Virginia Opera's "Carmen" plays Richmond CenterStage on April 4 and 6. For information visit vaopera.org or call 1-866-OPERA-VA.